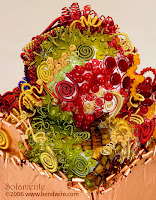 Read an interview with Melanie Schow today and I must admit this is the first time I heard or read the term Wire Embroidery. 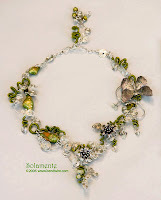 Maybe I have came across it somewhere before but it didn't have that impact until I saw Melanie's works as shown here. (Pst! I hope she does not mind me showing some of her works here). 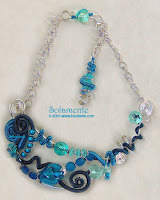 Visiting her website, Solamente, I was so captivated by her wire work and wire wrapped pieces. They are just awesome. I think I am getting hook into something new here. I hope she doesn't mind me posting some of her works here. 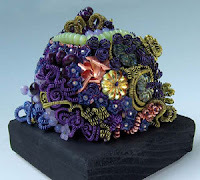 Just want to show how beautiful and intricate her pretties are and how I wish I can attend one of her classes or make pieces as pretty as these. Wow! Your eyes very "leehai" Bell. 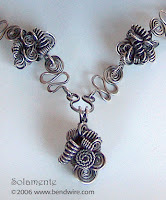 If I can make something like that, of course I will make one for you but.....we'll see....I am not sure if I can make something like that or not!